Yesterday, we drove for 21 hours and straight home from Texas. Thank God we got home safe and sound and just before midnight! We even had to drive through a snowstorm... so crazy!!! Then, this morning we woke up early to our own little family Christmas. Santa made a late little stop to our house last night! I have so many stories and pictures to share of our trip, my vintage finds, and just happy celebrations! Will be doing lots of catching up in this space next week! 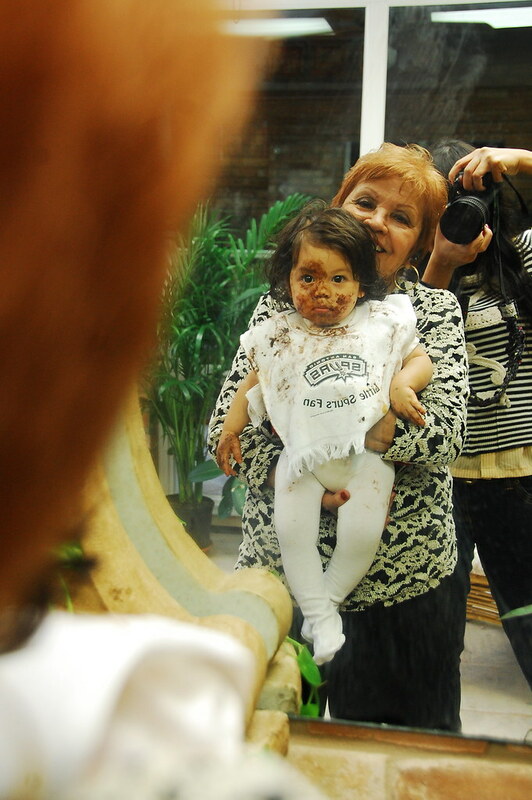 In the meantime, go to town for the New Year, just like our little Soulie did with her birthday cake frosting!!! We had another little birthday party for her with our family in Texas! Good times, I tell you, good times! Tonight we will be having our annual Bratcher Dance Party (depending if Ben feels better or not)! So fun and we are excited! How do you plan on ringing in the new year? 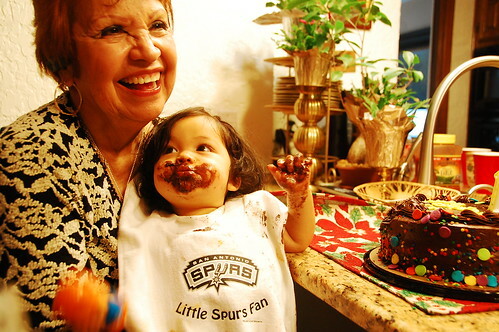 Look at her Spurs bib! Happy Birthday to her and a very Happy New Year to you and your family. That last pic is just adorable....Haaha. Heyy!Happy new year. Your daughters are as always amazingly cute! :) Happy new year. Hope you enjoy all the quality time with your family! appy New Year for you too, full of love and dreams and creativity! Happy New Year Bratchers and Happy Birthday to little S!!! Yes, you are crazy to drive 21 hours! I thought 8 hours was bad. I'm glad you're home safely now. We are having our own dance party tonight!!! I wish you a very, very good year!!! Happy New Year to you and your adorable family! I can't believe how small little Soulie is on your Bratcher dance party link,can you?I swear My youngest is skipping age points,she seems to have gone from baby to girl in 18m,missed the toddler bit completely:0( I guess that is just because I am running around after three others but still,doesn't the time fly? how was it with a loaded car?